For questions about the schedule you may contact Mrs. Orr at newmomorr@yahoo.com. For schedule conflicts or if you are unable to make rehearsal, contact Mrs. Vander Woude at erinvanderwoude@msn.com. Endtime 10:30 – no later than 11:00 p.m.
Make up and hair – if you can please come already made up and hair done – – if you need assistance you will need to arrive in a timely fashion in order to be ready to go by 6:00 p.m.
4:00 p.m. – Cast – arrive to get in full costumes IF you need a lot of time! Thursday, April 20 ,2017 (cast will be in dressing rooms for the show) FULL DRESS REHEARSAL!!! **Cast members do not all need to be there at 4 pm. Some take more time to do hair, makeup, etc. and some don’t need that much time. Please make sure you arrive early enough to allow yourself enough time: you must be ready to go by 6 pm. Reminder! Every family needs to sign up to chaperone for the performances. For those of you who missed the parents meeting or didn’t sign up to chaperone, please see this link. There are still open times available. Email Maryan Vander Woude (maryanlee@msn.com) with “Musical Chaperone” in the title line with your preferred time slot. She will confirm that time slot with you. I highly recommend that you bring someone who knows how to match skin tones when you get your items! I’ve already spoken with most of you about what you need. Having said that, please come see me Monday about details. Please bring what you have/think you’ll need to the makeup check on Monday and we’ll go from there. 2) There will be a makeup check on MONDAY, April 17. Please bring all the items on the list so you may be checked off and ready for Tuesday. 3) In the previous email you were told to arrive with your hair and makeup already finished unless you need help. I ask that if you have not been in a Seton production before or if you are a member of the Von Trapp family, that you come WITHOUT HAIR AND MAKEUP ALREADY APPLIED. We have several volunteers who will help in makeup application. Also, if you are uncomfortable with applying makeup yourself, please come early also. If you are coming without hair and makeup, from Tuesday forward, please arrive between 4:15- 4:45. Mr. Cook intends to be in the gym working every evening this week and would appreciate some helping hands. There’s still LOTS to be done! We are coming down to crunch time and we really need some helpers! Just show up in the gym anytime after 6:00 pm. Thank you!! The cast dinner is for all cast members, crew, and adult volunteers. Mrs. Vestermark is preparing a wonderful meal of baked ziti, salad, and rolls. Boys, please bring drinks (2 L. bottles or equivalent) and girls, please bring desserts. Mrs. Vestermark could use some help setting up before the dinner and cleaning up afterwards. Please contact Mrs. Vestermark if you can help with this at vestermarkx8@.gmail.com. Tomorrow, Wed. April 12, is the last day for the family discount for tickets. Tickets can be purchased for the entire family (immediate family only!) for $30. Get them tomorrow at the Seton office!! After April 12, tickets will still be available for $10 each. 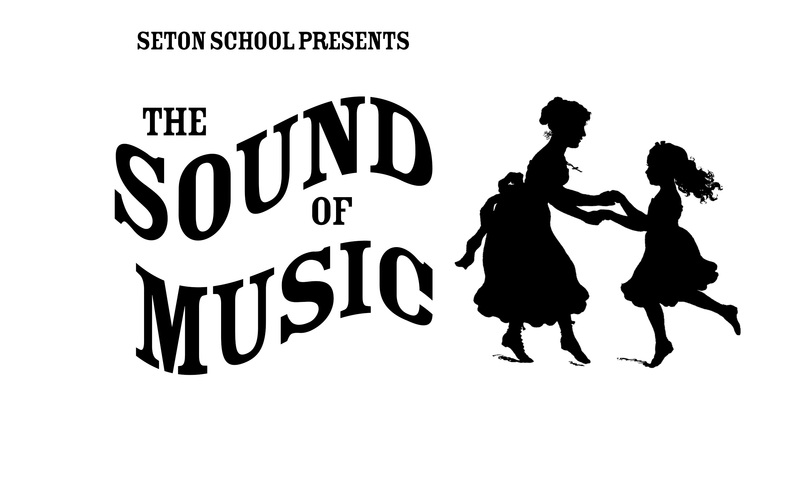 Do you want a “Sound of Music” t-shirt? Please email kimberly@dalrymple5.com by Friday 4/7 at Noon if you would like to pre-order t-shirts for the Sound of Music. This is a firm deadline. Include: 1) Total number of shirts, and 2) For each shirt specify long or short sleeve, Adult or Youth, and Size. · The shirts will be light blue with black ink. The back of the t-shirt shows all the musicals and the front is the cover art of Maria and Captain Von Trapp. · The long-sleeve are 100% cotton; short-sleeve are 50-50. · Pre-order price is $12 per shirt, long or short sleeve. Pre-ordering is an obligation to pay. · A limited number of shirts will be sold at the door and will be $15 each. · They are expected to be ready by April 20th. With the warm weather we want to remind all students that any skirts or shorts worn to rehearsal need to meet the Seton dress code. Skirts must go to knees. ( this is especially important when you are on the stage) and all shorts must be finger tip length. No tank tops. If you aren’t sure if it is ok, please wear something that is not questionable as a sign of respect for Mrs. Carroll and her rules. Tents and props needed- can you help? ~We are in need of quite a few of the pop-up soccer tents that could be used in the case of rain during our performances. Anyone who has one or two that we could borrow and take wonderful care of would you please contact Mrs. VW at erinvanderwoude@msn.com? Thank you! All Nazis- bring any shirts, jackets, and/or trenchcoats that you brought home back to Seton on Saturday morning to be accessorized! PARTICIPATION AND DEPOSIT CHECKS: There are still a few families who have not turned in their checks. Please turn them in at rehearsal this Saturday or take them to the school office (attn. Mrs. VW) this week– we really need to wrap up collecting these!! Any hardship or special circumstance concerning this, please let Mrs. Vander Woude know right away. Any non-named nuns, novices, and postulants who have not yet ordered your nun costume, please let us know (ASAP). A shortage of this particular nun costume is occurring on many of the website links we provided (and we’re hoping it is because all of our nuns are the ones ordering them! ), so we need to know how many girls still have not ordered them so that we can determine a course of action. This is really important! Thank you! Important costume information for the nuns (named and non-named), novices, and postulants! For shoes, ALL nuns should get jazz shoes, or if you cannot get jazz shoes, you can wear black ballet flats (plain, and not shiny…no buckles or decorations, please), and you will be wearing black tights. Link to chaperone schedule will be posted here and emailed out as soon as it is available- please stay tuned…. Ticket sales: Debbie Wykowski (wykowski@mindspring.com) will be coordinating ticket sales at some time in the future. More info to come….. Please let Mrs. VW know as soon as possible of any schedule conflicts at erinvanderwoude@msn.com. Again, for illness or any reason your child cannot attend rehearsal, please email Mrs. VW. Family and school comes first. If your child is having difficulty with school or home that affects rehearsals, please let Erin know. We can help and work with you if you let us know. Jill Cook and Lynne Morrison will be in Innocents across from Faustina during all rehearsals. Please stop by sometime during rehearsal (Wednesdays may be even better than Sat.- fewer people are usually there) and find out more about your student’s costume needs. All students will need to have their costume completed and checked off by April 1 at the latest, but sooner is better than later. If you are having difficulty with costume, they can help you. MRS. VANDER WOUDE AND WE WILL TAKE CARE OF THIS IMMEDIATELY!!!!!!! YOU MAY BE CALLED BACK FOR SEVERAL ROLES!!! The auditions will start at 6:00pm. All interested students need to arrive by 8:00 in order to audition and need to bring a photograph of themselves as well as the completed audition form. All students are encouraged to come with a song from a musical prepared (no “Happy Birthday”!) It is also encouraged to either have music to accompany on a tape or phone or to bring sheet music for Miss Erwin to accompany you. If you would like Miss Erwin to accompany you, please speak to her ASAP and be prepared to provide her with the sheet music. Click on link below for audition form and information page for parents and cast, and we look forward to seeing you on the 12th and 13th!